Within Teamwork Projects, you can create task dependencies within the project's Gantt Chart. Adding a dependency relationship between tasks allows you to make sure the tasks are completed in a particular order. Dependencies between tasks can be created in the Gantt Chart by dragging an arrow from one to another. To do this, hover over the task that you want to be completed first. You will see a grey dot to the right of the task. Click and drag this to the task you want to create the dependency with. 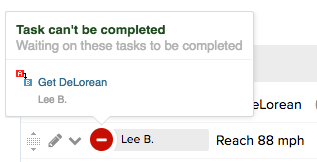 You will see an arrow created, linking the two tasks. Once saved, if you exist the Gantt Chart view and switch back to the Tasks tab, you will see the dependency has been created, with the second task unable to be completed until the first task is completed. You can also remove task dependencies within the Gantt Chart. To do this, hover over the first task that starts the dependency and click on the grey dot. This will show you the dependent task, with an option to remove by clicking the X.